Lymphedema is a serious, but treatable condition which involves blockage of the lymph vessels, with a resulting accumulation of lymphatic fluid which causes swelling and tightness in the affected area, often a limb. Lymphedema is generally diagnosed through observations, measurements and symptoms; some of its causes include trauma, surgery, cancer, obesity, circulatory disease and radiation. 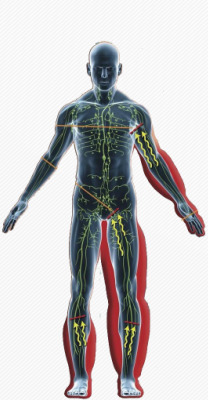 The job of the lymphatic system is to collect fluid from cells and transport it to the lymph nodes where it is filtered and then returned to the blood. When lymph vessels are damaged or missing and unable to properly do their job, fluid accumulates and creates abnormal swelling. Though lymphedema is a chronic condition, it can be improved with our comprehensive treatment program which combines Complete Decongestive Therapy (CDT), Manual Lymph Drainage (MLD), and compression therapy under the direction of our Certified Lymphedema Therapist. The benefits of early intervention are many, one of the most important being the prevention of further complications such as skin breakdowns which may lead to infections. With consistent treatment and adherence to a personalized therapeutic program, a life with minimal restrictions is certainly attainable, along with the overall improvement of the health of the patient.